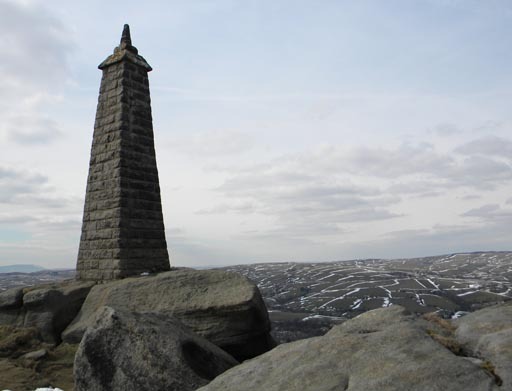 A quick wander round the territory ... Queensbury to Denholme and thence to the long way round to Wainman's Pinnacle, to return via Keighley. It ain't 'alf cold mum! 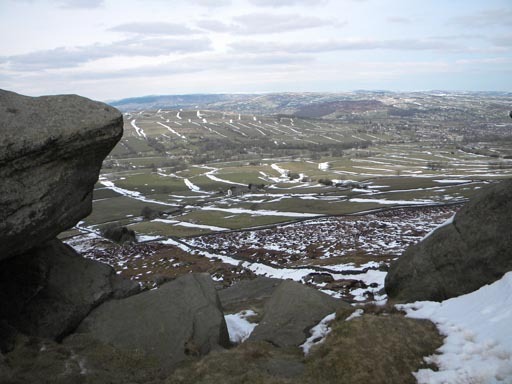 In the months following the first meeting of what we have come to call The Harrogate Agenda (THA), I have been careful not to push it too often on the grounds that over-exposure will simply invoke an adverse reaction. We are under no illusions that, when it comes to constitutional affairs, attention spans tend to be somewhat limited. Probably, though, I have erred on the side of caution, in that there is a greater demand for information than I anticipated. I also tend to make the mistake of assuming that because I know something and have discussed an issue with a few people, everybody in the group miraculously becomes aware of it. This, of course, is never the case. Communication, therefore, needs to be improved, to which effect Niall Warry is working up to produce a newssheet at regular and what I hope will become frequent intervals. As a matching initiative, I have agreed to produce at least one piece dedicated to the Harrogate Agenda on this blog, which I will generally post on a Sunday, unless good reasons suggest another day. There is also the option of using our dedicated website and there has been a commendable initiative in populating the site with our basic demands. However, I do not want to go down the route of promoting another website yet, until we have the resources properly to administer it and publish new material at least daily. 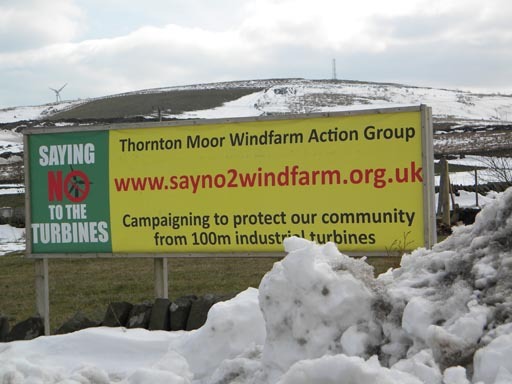 The enthusiasm of those involved is much appreciated, but we do not want to repeat the mistakes of other campaigning groups, in starting something when we can't keep up the momentum. To service a website properly we need people who have the time, skills and commitment and, if we are going to demand all three, our view is that they have to be rewarded for their effort. They must be paid. This brings me to the main subject of this post – the problematical issue of how we fund THA. Very broadly speaking, there are two models on which we can rely – the voluntary/donation and the business models. In other words, we can either seek to build the organisation on the back of voluntary labour, with the injection of cash donations, or we can set ourselves up as a "business", funding our activities through the sale of goods and services. In fact, any successful (and even half-successful) campaigning group tends to be a combination of both – a hybrid. The Bruges Group is a good example. It invites subscribers and donations, and it also sells its products, mainly pamphlets and meetings. From its profits, it manages to employ its director, Robert Oulds, and to finance its activities. The essence of this "business model" is that there should be saleable products and services, and it is here that a great deal of work has been going on behind the scenes. The aim is to produce a starter "package" by September, which will spearhead our fundraising activities. Before discussing this in detail – which I will do in next week's piece – I want to explore how we actually go about marketing this package, and it is here that the word "franchise" rears its head, inviting unflattering comparisons with well-known commercial operations. However, one should not get hung up on the word. Very often in literature we see it combined with another word, as in "political franchise", meaning – effectively – the mandate we give via our votes, to elected MPs. We chose to mean by "franchise" a mandate given to individuals and groups to go out and spread the word about THA, in a way that will ensure continuity and secure adequate funding. In short, at the "centre", we will develop a marketable "package" (of which more next week). But, instead of adopting a "top-down" marketing structure, where everything is managed and controlled from the centre (thereby limiting growth), we aim to make this available to volunteers (or franchisees) who will undertake to develop particular territories. By this means, the franchisees will be able to fund their own activities, with relative freedom as to how they go about their tasks. Those who wish to do so may be able to earn a modest living as well. We see every advantage in this. If people working for the cause are properly paid, they can keep up the momentum. Going back in history, there are plenty of precedents for using commercial activities to find political activism, not least the Cooperative Movement (illustrated top), which used the proceeds from its merchandising operations to fund a wide range of political activities, as well as supporting Labour MPs in parliament (in the days before they were paid a living wage). Although not exactly commercial organisations (when they were formed, although they have become so now), the trades unions were also a major source of political funds, while many political groupings and movements developed commercial arms (such as publishing newspapers and books), in order to fund their political activities. The Daily Worker and the Left Book Club are examples. Interestingly, it has been the Left which has been at the forefront in creating inventive funding solutions. This may be because the political activism starts with the grassroots, and cannot rely on wealthy backers. It seems sensible that we should do the same, and copy the best of what went before. The Deutsche Wirtschafts Nachrichten (DWN) has picked up on a letter from the Bank of Cyprus, discovered by the TV station Sigma TV, which shows the head of communications lying about the impending expropriation of depositors' funds. 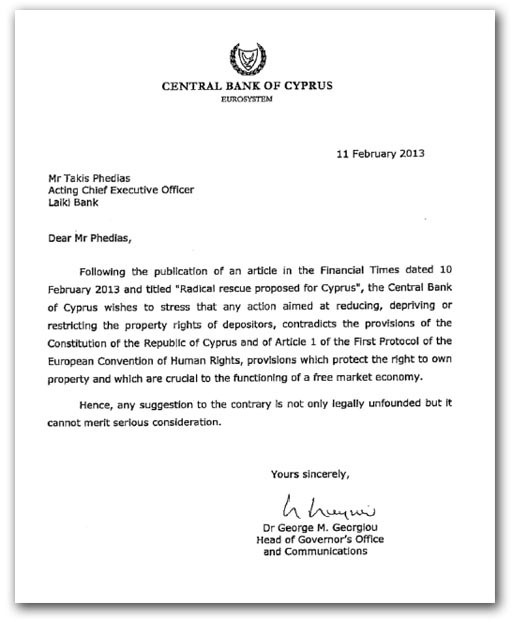 Dated 11 February – more than a month before the EU "rescue" - it refers to an article in theFinancial Times on 10 February, which suggested that the EU Commission was proposing to "force losses on uninsured depositors in Cypriot banks. The response from the Central Bank of Cyprus, signed by Dr George M Georgiou, the Head of the Governor's Office and Communications, was to deny the possibility of such an action. It would, wrote Georgiou, "contradict the provisions of the Constitution of the Republic of Cyprus and of Article 1 of the First Protocol of the European Convention of Human Rights, provisions which protect the right to own property and which are crucial to the functioning of the free market economy. Any suggestion to the contrary, Georgiou averred, was "not only legally unfounded" but it could not "merit serious consideration". A month later, this is precisely what happened, which has DWN observing that "outright lies are destroying the foundation of the economic system". The more powerful and less transparent the Central Banks become, the more necessary it is – in their view – to lie. In terms of the broader implication, that paper says that whatever Mario Draghi now does, you will have to think of Mr Georgiou's tactic: "smile and lie". You have to think: what the man is doing? Does it matter what he actually says? Does he mean the opposite of what he says? The paper goes on to say that, if blatant falsehood has become part of the central banks' legitimate means of communication, then they should be abolished. They have in recent years manipulated everything that can be manipulated. No one can believe them any more. Central banks turn out to be more than the cancer of the financial crisis. They are a strange hybrid, semi-political, semi Bank. They are not accountable to anyone. There is no transparency. There is certainly no control. From being the main custodians of financial stability, they have become the main players in the "global high casino", the paper says. This is stern stuff from a German newspaper, but it reflects a wider and growing sentiment. The central bankers are not to be trusted. They tell blatant lies and seem to believe that different laws and rules apply to them. Yet, says DWN, it cannot be that these institutions to not have to act in accordance with the rules governing any honourable businessmen. "Good faith" is a principle that must apply to all. Those who are setting it aside have stepped over the line which separates them from a criminal organisation. I am not sure the link will work for those who haven't signed up to the new paywalled Telegraph, but we'll try to keep to the tradition of posting the lead story of the Booker column, even if it can't be read online. Last week, writes Booker, as Britain and much of Europe were struggling through the coldest spring in decades, Sir John Beddington marked his retirement from his £165,000-a-year post as the Government's chief scientific adviser by touring the television and radio studios to terrify us all once more with his all-too-familiar message of how we are threatened by runaway global warming. Thanks to climate change, the litany runs, we now face ever more disruption to our weather, ever more floods, droughts, hurricanes, blizzards and all the rest. Whether it is too cold or too hot, too wet or too dry, we are meant to believe that it's all our fault and we must bring the climate back under control. In fact, it is far from clear why Sir John, as an expert in population biology, should be regarded as having any authority to pronounce on such matters. A year or two back, for instance, he was telling us that by the end of this century we can expect the warmest days in Europe to be 8ºC hotter than they are now, and that in America they will be 11ºC hotter – claims that exceed even the wildest predictions of the UN's Intergovernmental Panel on Climate Change. Sir John's predecessor, for instance, was Sir David King, a "surface chemist" who got entangled in controversy over a seeming prediction that he made to MPs that by the end of this century, unless we curbed our CO2 emissions, the world could well get so hot that the only continent still habitable would be Antarctica. It was he who came up with the unique claim that the extinction of the dinosaurs "55 million years ago" was caused by the world overheating thanks to soaring levels of carbon dioxide. In fact, the end of the Mesozoic era is generally agreed to have been 65 million years ago, and no one apart from Sir David ever seems to have claimed that the dinosaurs’ disappearance was due to an excess of CO2. King's predecessor as chief scientific adviser was Sir Robert (now Lord) May, another population biologist who is a complete fanatic on global warming. He was the "top expert" called in by the BBC to address that secret seminar in 2006 when he advised its top executives that they should stop giving airtime to "climate deniers" who only take the view they do because they are in the pay of the fossil-fuel industry. A remarkably similar line has been taken by the man who is now to succeed Sir John in the post, Sir Mark Walport. He is a specialist in immunology, who in 2011 rushed to endorse that dotty report for the BBC Trust by the snail expert Steve Jones, advising the BBC that it should show not less bias on climate change, but more. 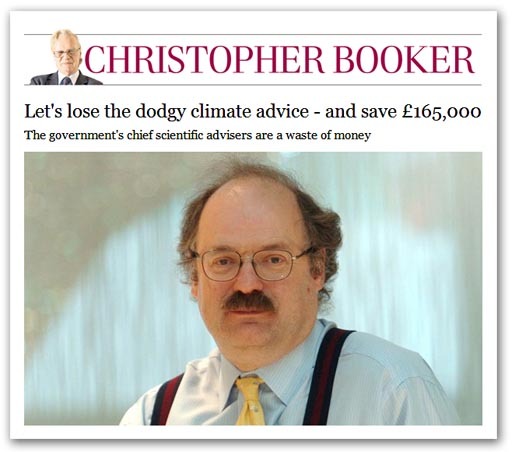 Since it seems that the only purpose of having a chief scientific adviser these days is to parrot the official line on global warming without having any very obvious understanding of the subject, concludes Booker, isn't it time we saved ourselves £165,000 a year by abolishing this post altogether? Although there has been a great deal of attention paid to domestic energy costs recently, less has been focused on the depredations of the water companies, which have been stealthily increasing their charges. 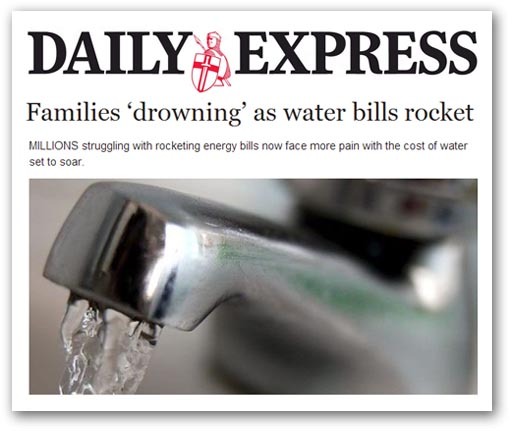 However, this was picked up by The Daily Express last Wednesday, when it told us that the average annual water bill is due to rise to £388, with effect from Easter Monday. Overall, there has been a 3.5 percent increase, year-on-year, approved by water regulator Ofwat, yet another increase to service the corporate behemoth. 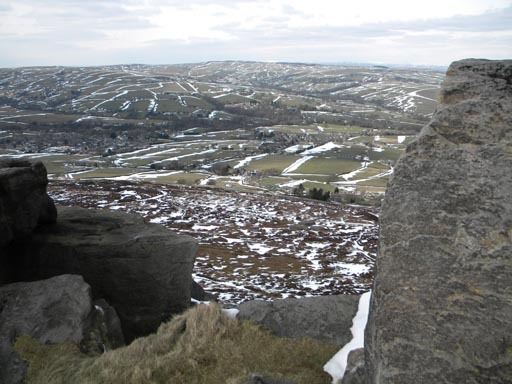 Certainly, our local provider, Yorkshire Water, needs the money, its holding company having to find £800,000 in salary and pension contribution for its "highest paid director", which presumably is CEO Richard Flint. That leaves Yorkshire Water to pay the bonuses, which would put Mr Flint into the million pound bracket. According to Ofwat chief executive, Regina Finn, the increase in charges is "driven by inflation" and "will pay for investment in the industry". But what neither Ofwat nor the Express tell us is that water bills have all but doubled in the last ten year. In 2003, we had to find £157.28, and now Mr Flint needs £293.84 as our contribution to his pension fund. 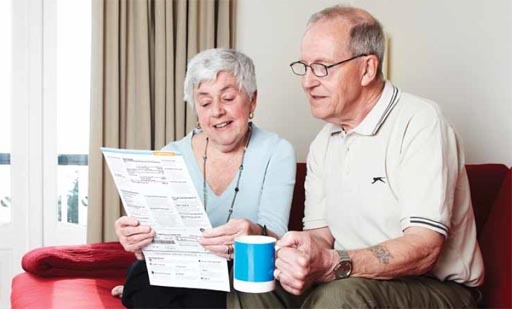 The happy world of the water industry, though, is populated with smiling customers reading their bills (above, from a YW corporate brochure), with Yorkshire Water telling us, "We deliver our services to customers at a price they are willing and able to pay, whilst providing investors with returns that attract long-term investment". The fact that, if we want a water supply, we have no choice whatsoever, seems rather to have escaped them. But, at least, the water companies do seem to have a choice about whether they pay tax. As theObserver reported last year, three of Britain's biggest water companies paid little or no tax on their profits while generously rewarding their executives and investors. Thames Water and Anglian Water paid no corporation tax on the profits made from their utility businesses. 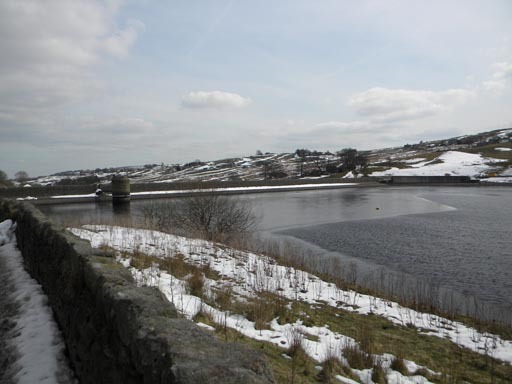 According to the monitoring organisation Corporate Watch,Yorkshire Water, with a turnover of £893.6 million made an operating profit of £303.3 million, but paid only £2.9 million in corporation tax. This it achieved through artificially adding to its debts by taking high interest offshore loans, via its intermediate owner Kelda Holdco Ltd, thereby reducing its taxable profits in the UK. But then, when your owners are investment funds based in the US, UK and Singapore, and the HSBC, acquired for the princely sum of £3 billion, one must take every little advantage on can, including a quiescent Ofwat which seems quite happy to allow its charges to maximise the use of tax havens. Thus are water companies treasured for their "stable cash-flows and sizeable dividends", which can continue for as long as they are so easily allowed to milk their customers. And we are supposed to believe that private ownership of our assets is somehow better? 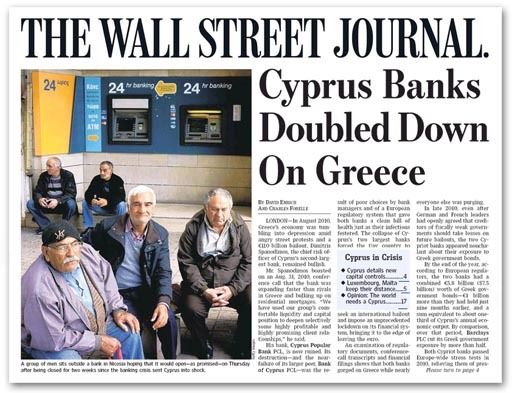 Eurocrash: corruption at the heart of the Cypriot crisis? It was Tuesday when I was writing that there were more details on Cyprus yet to emerge. That was a fairly safe prediction, but the point I was trying to make was that there is more to this "rescue" than meets the eye, and the real reasons for the behaviour of the "colleagues" has yet to emerge. We might be getting a little closer though with the revelations breaking in the Greek press, conveyed also by ekathimerinini.com and in Spiegel. These tell of an unhealthily close relationship between the Cypriot banks and politicians, and with political parties and trades unions. Thus we hear that the Bank of Cyprus and Laiki, between 2007 and 2012 gave loans amounting to millions to these groups, without in any way seeking full repayment. The Bank of Cyprus wrote off the €2.8-million loan given to a hotel with ties to the communist-rooted Progressive Party (AKEL) and forgave significant portions of many other loans. A national labour union is said to have been forgiven €193,000 of a €554,000 loan. An unnamed company was forgiven €110,000 from a €1.83-million loan, a prominent MP of the centrist Democratic Rally (DISY) party saw €101,000 of a €168,000 loan written off and a company owned by the brother of a former minister of the conservative Democratic Party (DIKO) had €1.28 million of a €1.59-million loan written off. Several other MPs and the mayor of large city allegedly had significant portions of their loans forgiven by Bank of Cyprus. Companies linked to a member of the bank's board, to the daughter-in-law of a DIKO deputy and several others also appear to have been offered significant loan relief by the Bank of Cyprus. As for Laiki Bank, it is said to have written off several loans taken out by AKEL and DISY MPs. The bank appears to have written off $5.8 million in debt from a company whose majority shareholder is said to be a well-known Cypriot politician. The ex-wife of a senior ministry official and a company owned by a local ambassador appear to have been benefited. These details, apparently, are only the tip of the iceberg, and more are expected to emerge. The Greek newspaper Ethnos writes that the current details raise "significant political and moral issues" that could have a "serious legal repercussions". Most of all, though, they may shed light on why Cypriot banks had been allowed to behave the way they did, pushing the economy over the edge. This may also explain why the "colleagues" took the action they did, possibly with the foreknowledge that this was not a straightforward bailout. Awareness of deep-rooted, systemic corruption could have dictated the path. For the moment, the Cypriots are being extraordinarily calm about recent developments, and some feelings are being expressed that external intervention was necessary. The island nation may have needed more than just a financial rescue, which could put a completely different complexion on the events we have been witnessing. Yet even this is only the half of it. As Wall Street Journal reports, while other lenders were seeking to divest themselves of Greek debt, Cypriot banks were piling in. In late 2010, even after German and French leaders had openly agreed that creditors of fiscally weak governments should take losses on future bailouts, the two main Cypriot banks appeared nonchalant about their exposure to Greek government bonds. By the end of the year, the two banks combined had acquired €5.8 billion of Greek government bonds, a billion more than they had held just nine months earlier. By comparison, over the same period, Barclays had cut its Greek government exposure by more than half. But the regulators do not come out of this clean either. Both Cypriot banks passed Europe-wide stress tests in 2010, relieving them of pressure to change course. They passed again in 2011 and have now booked combined losses of €4.3 billion on their Greek government-bond holdings. This result transcends normal incompetence, and given the emerging evidence of corruption - all in the context of highly suspect transactions in Greece - it seems increasingly implausible that the Cyprus "rescue" could have been treated as a normal bailout. With the crooks raiding the cookie jar, just giving them more money was never an option. Mass immigration erodes our national solidarity, complains David Goodhart in his "controversial new book". But, while we would not begin to disagree with that premise, does not Mr Goodhart realise that this is the intended purpose of mass immigration? From all sides, nationalism is under unprecedented attack, and no better weapon has been devised by the internationalists and surpranationalists than unrestrained immigration. That does not stop Goodhart having some good ideas but, since he misdiagnoses the problem, his nostrums necessarily lack power. First and foremost, we need to rehabilitate nationalism, and repossess it from the so-called "hard right". Only a confident nation state can properly manage its borders, and set the acceptable parameters for permitting entry. Immigration policy cannot properly be defined by any other body, as it is the very existence of borders which defines the nation state, and only a fully functioning nation state will protect them. 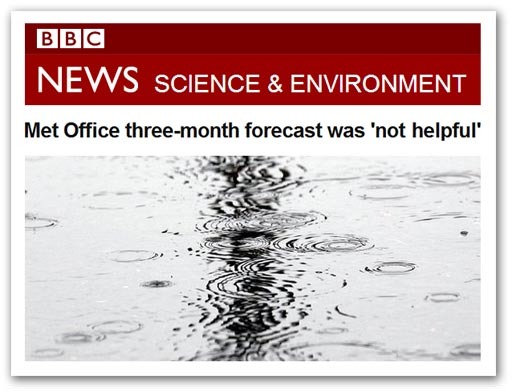 Climate change: Met Office advice "not helpful"
One can almost concede that the BBC has done something useful, in seeking out the Met Office's unpublished three-monthly outlook produced at the end of March last year. Then, the Met Office predicted average rainfall and "slightly" favoured drier than average conditions. 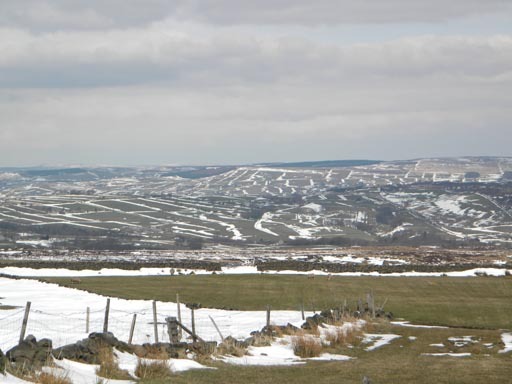 Yet, between March and April 2012, the UK experienced an extraordinary shift from high pressure and drought to low pressure and downpours. After the embarrassment experienced by the Met Office following its infamous "barbecue summer" forecast of 2009, the state meteorology service had ceased publishing its seasonal forecasts. But it still made them available to contingency planners and government bodies, such as the Environment Agency. However, it has admitted that the advice it issued was "not helpful". The words of its analysis later confessed: "Given that April was the wettest since detailed records began in 1910 and the April-May-June quarter was also the wettest, this advice was not helpful". In a note to the government chief scientist, the Met Office chief scientist Julia Slingo sought to explain the difficulty of constructing long-distance forecasts, given the UK's position at the far edge of dominant world weather systems. She said last year's calculations were not actually wrong because they were "probabilistic". This is a wonderful intellectual sleight of hand, allowing the Met Office, like so many bureaucracies, to deny that it ever gets anything wrong. And this is perhaps more necessary than most people think. 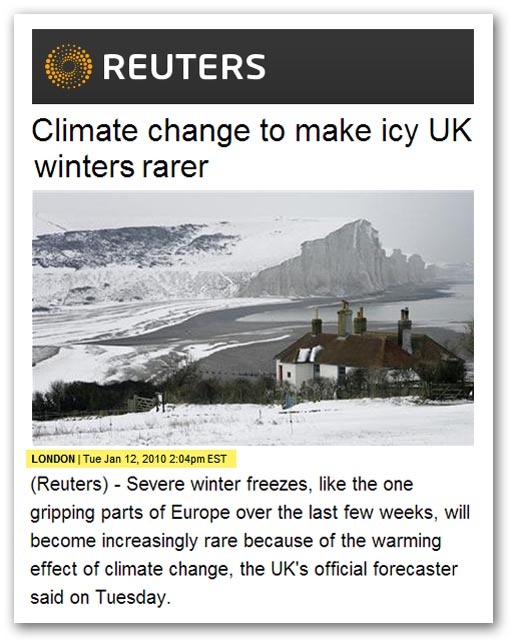 As Booker points out in his 3 October 2009 column, one reason why their short-term forecasts are often so comically wrong is that, as the Met Office likes to boast, they are produced with the aid of the same super-computer used to provide the IPCC with its predictions of what the world's climate will be like in 100 years' time. According to the Slingo doctrine, these forecasts are not actually wrong, because they too are "probabilistic". Most, likely, though, they are just about as helpful as the quarterly analyses, which by the Met Office's own admission, means not helpful at all. Nevertheless, in the way of things modern - as Autonomous Mind so often points out, this does not stop it awarding its staff handsome performance bonuses. For her forecasting performance in 2011/12, Slingo was awarded a bonus of £25-30,000 on top of her £135,000 annual salary. The nature of the beast, however, can be deduced from her responses on the BBC Radio 4's Today programme, this morning, when she admitted that a serious pressure on water resources in March last year did mean a "slightly enhanced risk" of the drought continuing into April. 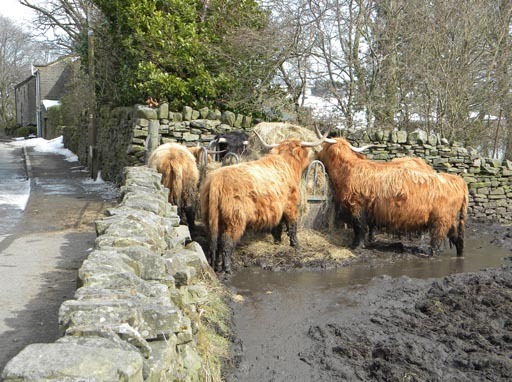 "I felt it was right to emphasise the risk of dry conditions continuing as a precautionary principle", she added, justifying this by saying that: "We have to look over a large number of events and I think on about 65 percent of occasions we do give indeed very helpful advice". Basically, flipping a coin gives a fifty percent probability of giving "helpful advice", which means that Slingo gets her bonus for the extra fifteen percent, over and above random. Nice work if you can get it. As predictable as the sun rising in the morning, EU officials are using the latest crisis as an argument for "more Europe". This time it is EU Internal Market Commissioner Michel Barnier, whohas demanded as a consequence of the Cyprus crisis, that the management of the eurozone should be strengthened. Monetary union, he says, needs a dedicated "Ecofin" type body, merging the offices of the eurogroup chairman and the EU economic affairs commissioner. Strangely, he gets short shrift from the chairman of the Union Group in the Bundestag finance committee, Hans Michelbach (CSU). 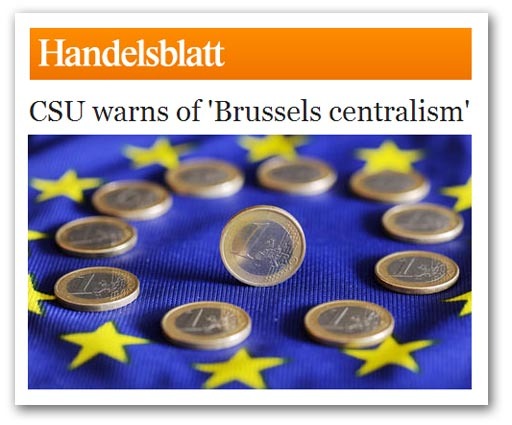 He rejects the idea, saying that this "is another flimsy attempt to expand Brussels centralism". This does not solve the problem, he says. Rather, it threatened to proliferate problems. Such a lack of enthusiasm for further integration might seem a bit odd, although some Germans arestill feeling bruised by the bad press they are getting. "Germanophobia is unfair", declares Spiegel. However, before you decide whether it is safe to go out, check out FAZ Robert Menasse and Ulrike Guérot proclaim: "Long live the European Republic". No nation state can solve problems alone, they say, but it is the lack of democracy in Europe that prevents it coming into its own. This is one of a raft of articles on the same theme. The pursuit of European political integration is very far from dead. Spiegel though has other fish to fry, telling us more about the run of money out of Cyprus. The banks there are saying it was impossible to prevent all money slipping out of the country, despite the account freeze. Much of the money was withdrawn from overseas, where Cyprus had no authority. Branches of Cypriot banks in non-eurozone countries such as Russia and Britain do not answer to the European Central Bank. Their liquidity is controlled by central banks in those countries. What is priceless, though, is the magazine's comment that their defence is "nothing less than a voluntary admission of impotence". Holders of smaller savings accounts, it says, have been unable to access much of their money for almost two weeks, companies have been unable to pay their suppliers and across the country people are concerned that their salaries will not arrive on schedule on the first of the month. Meanwhile, rich business people and those with connections overseas have been able to transfer their money into foreign accounts, says the magazine. And that is the reality of the European Union. For all the talk and the high aspiration, it's about the little man being shafted. Left over from yesterday is the latest in the ongoing battle of the budget, this round concerning the 2013 tranche. 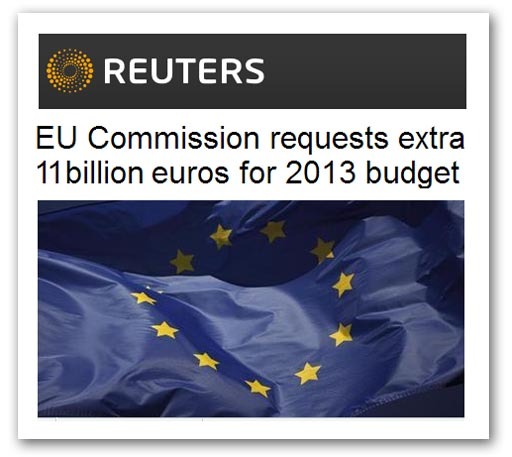 Already set at €132.8 billion, the Commission has cone up with an "amending budget", adding another €11.2 to that figure, in an attempt to by-pass the cap on the multi-annual spending target. It would represent an 8.4 percent increase over the level already agreed in December, pushing annual EU spending to its highest level ever. The extra funds must be approved by both the European Parliament and the Council – the latter by qualified majority voting – which means that the UK cannot block them, even though Downing Street has pledged to fight the proposal which would cost us about €1.2 billion. The European Parliament, which has been calling for extra funding, is most likely to approve the amending budget, and is threatening to block the multi-annual agreement unless the Council caves in, something about which Schultz has made himself abundantly clear. Meanwhile, the Commission is not pulling any punches. "This cannot come as a surprise", EU budget commissioner Januz Lewandowski says, referring to the current gap between projected income and commitments. "The ostrich policy can only work for so long: postponing payment of a bill will not make it go away". Britain's Financial Secretary to the Treasury, Greg Clark, has nevertheless described the Commission's proposal as totally unacceptable. "It is extraordinary that the Commission should demand an increase in the EU budget that is bigger than the rescue package that was agreed for Cyprus earlier this week," he says. And the point made is a good one. Considering all the hullabaloo there has been about €10 billion to the Cypriots, for the Commission to dump another €11.2 billion on the tab is more than a bit tiresome. Lewandowski, though, is unrepentant. In recent years, he says, EU budgets had been "increasingly below the real needs based on estimates from member states". Now this is creating a "snowball effect" of unpaid claims transferred to the following years. This is what originally proved to be the breaking point on the multi-annual budget, with the Parliament refusing to take a hit in order to pay outstanding bills. Now it is coming back to haunt Mr Cameron, further eroding his budget "victory" last year. The interesting this is that the use of the amending budget was flagged up in November 2010, and the funding gap was highlighted last October. Then, we wrote that, when the "colleagues" come round with their begging bowl, Mr Cameron is going to have to find about £1 billion to put in the kitty. Thus, Lewandowski is absolutely right. This shouldn't come as a surprise. But that does not stop it being a major embarrassment to Mr Cameron. The last thing he wants is to have to find another €1.2 billion for the EU, or the prospect of demonstrating his impotence when it comes to trying to stop the "colleagues" taking it. But Mr Cameron want to stay in the EU and, if he does, political embarrassment is part of the personal price he must pay. The German media (such as here) is having great fun with the municipality of Kiev. It has recently been stricken with record snowfalls, invoking a flood of complaints about the lack of snow clearing. 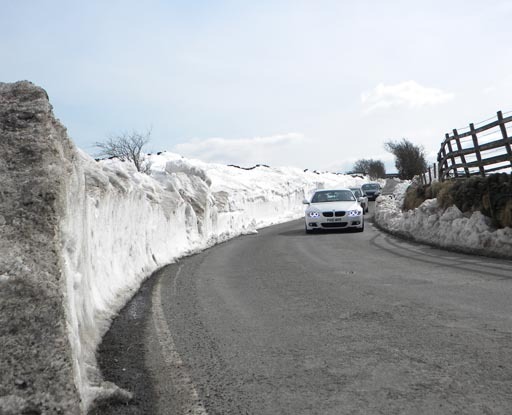 In response to the complaints, the administration on 26 March posted on its website a glorious photograph of three of its snowploughs, clearing the streets to let the traffic through (above). Spotted by Facebook user Jaroslaw Debeli, though, there were slight problems with the photo. It came not from Kiev, capital of Ukraine on 26 March, but from Moscow on 29 November 2012. In an attempt to conceal its identity, Russian license plates and other telltale detail had been digitally obscured. Despite this, a spokesthing for the city government dismissed the image as a "technical error". The web administrator responsible "was probably tired because he had been working non-stop for several days", the spokesthing said. Clearly the British authorities could learn from this. Complaints of failure to clear snow can so easily be addressed by posting photos of successful snow clearance from other eras. After all, since Dr Viner told us that snow was "a thing of the past", this snow cannot be here. It must be virtual snow, in which case virtual snowploughs are the obvious answer. 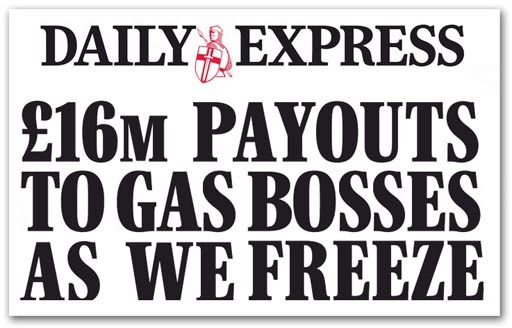 The Daily Express is trying to steal a march on the Mail in the outrage stakes, highlighting on its front page the latest example of corporate greed. This time it is Centrica directors, milking £16 million in salaries and bonuses from the cash mountain acquired by British Gas. Chief executive Sam Laidlaw raked in almost £5 million, with his salary of £950,000 topped up with bonuses and long-term share awards of over £2.6 million, plus benefits. Outgoing British Gas managing director Phil Bentley saw his total remuneration leap to £3.1 million in 2012 from £2.1 million a year earlier. His basic salary was £635,000. Head of power generation Mark Hanafin, finance director Nick Luff and North American boss Chris Weston each received between £2.5 million and £3 million. Critics, we are told, described these payments as "excessive greed", but that's a new one on me. What is excessive greed? Greed, by definition, is excessive. One is also less than impressed by the mouthings of sundry trades unionists, including TUC general secretary Frances O'Grady. The paper has her saying, "At a time when the poorest households are struggling to make ends meet and are spending over a quarter of their incomes on fuel bills, these huge payouts are insensitive beyond belief". Nevertheless, O'Grady has a point – and even more so does Unite general secretary Len McCluskey, declaring, "It is obscene and is the straw that could break the back of corporate excess". He adds, "Enough is enough. This excessive greed sees casino bankers and the corporate elite running British business pocket millions while working people struggle to pay their soaring household bills. It must stop. As Britain goes through the worst March weather in half a century, the sun shines brightly on Centrica's bosses while those struggling to pay the bills shiver". Yet, in this country, the government objects to caps on executive pay, and the people don't have a choice - unlike Switzerland. But, since the EU is proposing controls, this plays into the hands of the evil empire. It is taking a populist approach to the issue, where the British government is loathe to act. Mr Cameron, therefore, would be unwise to ignore this. There is a strong and genuine resentment of the pillaging of these corporate thieves. No one with any sense has any objections to executives of major enterprises being well paid, but multi-million salaries and bonuses paid to corporate employees are theft, pure and simple. What the powers that be possibly don't appreciate is the message this sends out, and the moral implications. How can the State condemn, or rightfully punish, the anyone stealing property, when it condones theft on such a vast scale? And, while the State might tolerate this situation, politicians need to be aware that public patience is limited, and resentment is growing. "Last chance saloon" doesn't even begin to describe it. Gradually, more details are emerging on the background to the Cyprus bailout. Handelsblatt isn't the first or the only one, but it is offering one of the clearest reports, alleging that large amounts of money were withdrawn from Cyprus just before the shutters came down. Amongst the accounts cleaned out, it seems, were those of senior officials from the Cypriot banks and the government, and the suspicion is that they have been transferred to another EU country. The Cyprus Parliament President Giannakis Omirou is examining the suspicion that unusually high remittances were made abroad, with greater cash withdrawals than there should have been. Omirou has requested a list of the transfers in recent weeks and is also examining the government in Nicosia to see whether large sums were transferred abroad as the banks closed and the online banking was locked down. The extent of the capital outflow has been so huge that the Cypriot banks need far more money than just the money customers had withdrawn from ATMs. Süddeutsche relays a suggestion that there were up to ten billion euros deposited by Russian citizens. Other estimates put the sum at double and more, but it is difficult to determine precisely how much, as so many of the origin of many deposits are concealed in shell companies. 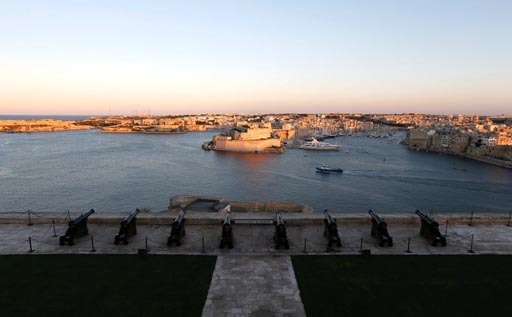 Top of the list of destination countries is Malta (pictured) and it is now known that Cypriot law firms were recommending to their foreign customers with companies in Cyprus to maintain accounts in Malta. This trend increased dramatically after the first speculation about the involvement of savings in the bank bailout. Furthermore, an international law firms based in Texas sent targeted e-mails to Cypriot companies, telling them: "Malta has a strong financial sector, a good growth rate and low government debt". Apparently, firms in the Isle of Man and Latvia are also taking in refugee funds from Cyprus and there are also reports that there has been a substantial inflow of funds from diverse sources into Jersey. Back in Cyprus, a massive convoy brought five billion euros in cash in from Larnaca Airport to the Central Bank in Nicosia after it has been shipped in, preparatory to the banks reopening today. The news is that withdrawals are to be limited to €300 a day, with transfers abroad capped at €5,000 a month. If the bird has already flown, though, it maybe that the crisis is by no means over, as there may be insufficient in the banks to deliver the sort of cash the "colleagues" are expecting. And then there is the little matter of Luxembourg, which may also be in line for some corrective action. Meanwhile, with Cypriot riot police standing by to keep order, anti-German sentiment is growing, leaving Germany to complain that the "colleagues" are not defending it against unfair criticism. Solidarity is required, FAZ concedes, but just because the German government insists on a return, it is pilloried. One can only wonder at Mrs Merkel's composure in the face of the insults she has had to put up with, the paper says. Comments are often "negative and rude". Germany, it says, is living the Thatcher experience. European governments used to hide behind the British prime minister, because they dare not say the things she said openly. Now the federal government is being blamed for a policy that is in line with other EU partners. So, says Handelsblatt, "keep calm and look forward to Easter", when the markets close for the holidays. Sounds like a plan … better than most. UK politics: David Miliband resigns - do we care? Do we actually care that David Miliband is quitting as an MP for South Shields and walking away from the "soap opera" of British politics? And does it matter that he is putting the taxpayer to the considerable expense of finding a replacement – not that it will make a blind bit of difference. 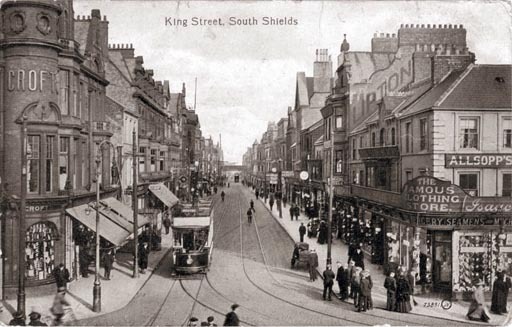 South Shields was first represented by Labour ever since 1929, when JamesChuter Ede took the seat with a majority of 40, only to lose it to the Liberals in 1931, who regained the seat with a stonking ten thousand majority. Ede took it back in 1935, fending off a challenge from the National Labour candidate as well as the Liberal, possibly benefiting from the opposition vote being split. He kept it in 1945, and the seat has stayed Labour ever since –giving them a near 80 years of unbroken tenure. In the last election. Miliband polled 18,995 votes, as against 7,886 for his Conservative rival, and 5,189 cast for the Lib-Dems. UKIP did not stand. The overall turnout was 57.7 percent, giving young David a mandate from just 30 percent of the electorate. One assumes that UKIP will field a candidate for this thoroughly irrelevant contest, hoping to repeat the Eastleigh "success" of beating the Tories into second place. In South Shields, this is a bit like shooting fish in a barrel, although UKIP have always struggled to maintain a presence in the North-East, and have yet to gain an MEP in this region. However, BNP did quite well in to General, polling 2,382 votes, many of which are potentially transferable to UKIP, assuming that BNP does not stand again. But with Lib-Dem support in the constituency eroding (the party lost five percent at the General), it looks another shoe-in for Labour. Nevertheless, the fight for second place should provide some entertainment. 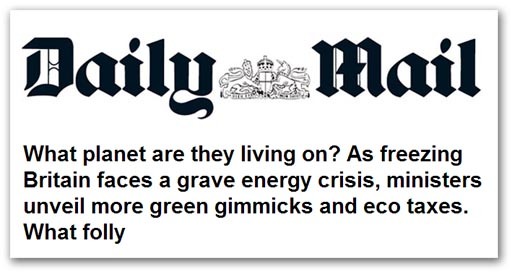 As gentle flurries of global warming descend again from the skies this morning - turning into a steady cascade - Booker writes in the Daily Mail on one of his favourite subjects – the coming energy crisis. Not entirely coincidentally, the front page tells us to expect £286 in green taxes on energy bills by 2020. Already, we are told, we are paying £112 on an average bill of £1,267. In fact, it is going to be a lot more than that – the Mail is relying on government figures. But what is terrifying here is that ministers have swallowed the green mantra – that increased costs will be offset by efficiency savings, with DECC claiming that the increase will be offset by efficiency savings of £452 a year. There is no meeting of minds here. We are dealing with energy secretary Ed Davey. He refuses to see past his own departmental propaganda, into the real world, and simply repeats his mantras, not budging an inch. Cue then the Daily Telegraph which gives him space for an authored piece, telling us that "coalition policies are not only about tackling climate change, diversifying supply and creating jobs, but also about saving money on bills too". And the Telegraph thinks we are going to pay for this sort of guff via a paywall? But, if this doesn't take the biscuit, we have Labour's energy spokesman Caroline Flint, who roundly criticises the energy policy, declaring that, "the Government's underhand attempt to mask the real impact of its policies on families' energy bills is shameful". Yet this is the same Labour that, under Ed Miliband, launched the Climate Change Act, with the near-unanimous support from all sides of the House. When it comes to energy policy, therefore, there is not much to chose between the lot of them. They are as bad as each other. Sadly, that typifies modern politics. There are only a very few policy issues where there are any real differences, and those differences are not enough to make the difference. All parties are tarred with the same brush. Effectively, that leaves most people with a feeling of powerlessness, and explains why so many are walking away from the political system. But energy policy, like so many other aspects of government, cannot be fudged forever. When the lights do go out – and that looks more likely than ever – there will be a reckoning. There will have to be. Modern society cannot function without cheap energy and successive governments which have deliberately sought to increase costs for no good reasons need to be brought to account. Readers will recall the tragic helicopter accident during a police exercise in Berlin last week during a heavy snowstorm, and also the pile-up in the snow on the A45 in Hesse, near Münzenberg, a fortnight ago. 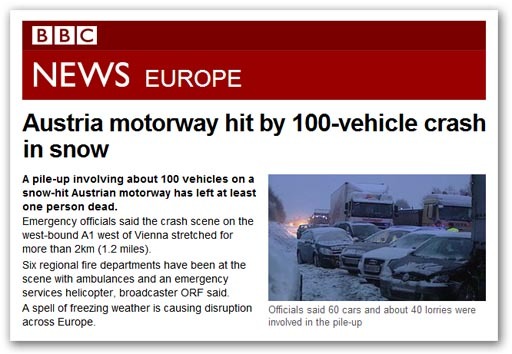 Now, courtesy of the BBC, we learn of another pile-up involving on the continent, this one on an Austrian motorway, involving 100 vehicles, leaving at least one person dead. In passing, the state broadcaster also tells us that there is a spell of freezing weather is causing disruption across Europe, adding that an icy carriageway was a likely factor in this crash. And this was not the only major incident. In southern Austria, at least 29 people were injured - six seriously - in two accidents inside road tunnels. The A2 motorway, which runs through the tunnels, was blocked in both directions. Further east, there has been record-breaking snowfall in the Ukrainian capital Kiev has caused traffic chaos, which has seen many residents taking to skis instead. Minsk has also been badly hit, and three regions of Romania heavy snow has blanketing three regions, closing schools and disrupted road traffic. The freezing weather, we are also told, has also caused chaos on Serbia's northern border with Hungary where lorries queued for hours amid heavy snowfall. Black ice coating roads in neighbouring Croatia has caused a spate of accidents. Then, thousands of people in Hungary found themselves trapped in heavy snow after a sudden cold snap and high winds swept over Eastern Europe. Budapest has deployed tanks to reach motorists trapped by the conditions. The heavy dump has trapped people in cars, buses and trains as dozens of major roads across the country were blocked by the snowfall. And it isn't just that. In Germany, it is estimated that long, cold, dark winter could cost up to €6 billion in extra healthcare and lost productivity as people stay away from work sick, as well as causing terrible confusion to the humourless German police. So long and so often have we been hearing the laments from the warmists about the perils of warning that it is about time that they stopped and gave some real though to the far greater dangers and disruption arising from cold weather, and the economic cost. Even then, there are the hard-line warmists who believe that this spell of bad weather is directly the result of "climate change", not able to deal with the reality of a cooling planet. 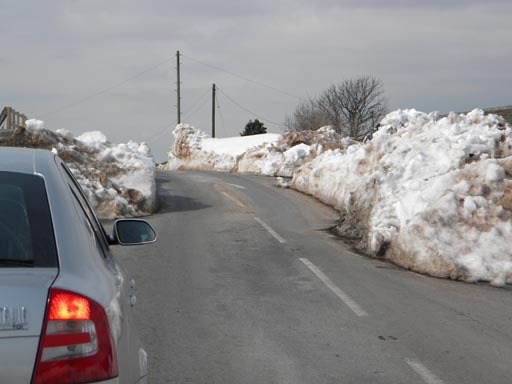 Their obsession is diverting massive resources from the real problem, so much so that even at local level, English councils spending hundreds of thousands on the salaries of climate change officers cannot afford to clear the snow from the streets. When finally, sense prevails – as indeed it must – we shall, in our winter of discontent, remember these people. The evil that men do should not live after them. We cannot afford it. Whenever a politician promises a "crackdown" on immigration, you just know that it will come to nothing. That was certainly the feeling yesterday when David Cameron told an audience of students at University Campus Suffolk in Ipswich that world he planned to show illegal migrants "the door" and rein in welfare benefits he believes lure foreigners to live off the British state. Specifically, he declared that certain measures would apply to "all citizens of the European Economic Area", with immigrants having to wait up to five years for social housing. And they would also be subject to tougher "reciprocal charging" requirements when using the National Health Service - meaning their own country will have to pay. Very quickly, Cameron was accused of "the worst kind of dog-whistle politics", accompanied by reports of his pledges "unravelling" within hours of his speech. 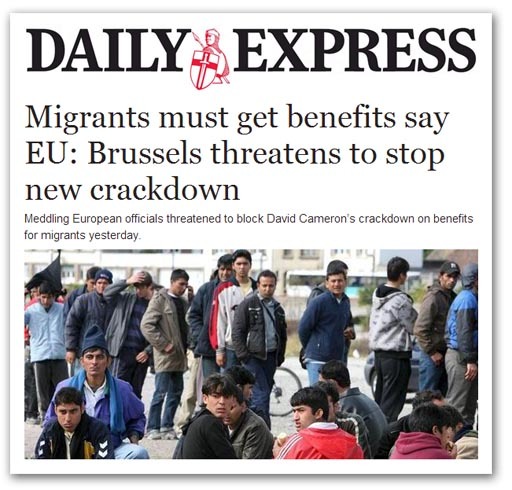 Then, today, we have the Daily Express report that "Brussels" was threatening to block the "crackdown" before it had even started, apparently warning that his proposals – including restrictions on housing, health and unemployment support – must comply with EU free movement rules. So, once again, we a mired in uncertainty, bumping against the limits of EU law, which circumscribe what a British government can do. Actually, though, the restriction is not so much "free movement" as Article 18, by which "discrimination on grounds of nationality shall be prohibited". Mr Cameron can impose all sorts of restrictions on benefits, and eligibility to social housing, as long as those restrictions apply uniformly to all residents, whether British or not. Basically, though, as long as a citizen of any EEA member state can pass what is known as the "habitual residence test", and then conform with the national eligibility criteria for any benefit or service, their entitlements must be placed on the same basis as resident British citizens. However, Mr Cameron is making a particular play on social housing provision, declaring that, "New migrants should not expect to be given a home on arrival". He thus says he intends to introduce new statutory housing allocations guidance this spring, "to create a local residence test" which "should mean local people rightly get priority in the social housing system". What Mr Cameron doesn't say, though, is that Local Authorities (LA) have a statutory duty to house certain categories of the homeless, which includes those who have dependent children. If immigrants who are able to pass the "habitual residence test" fall into these categories, the LA is obliged to house them, irrespective of whether they are local or not. Very often the so-called "statutory homeless" will be housed in temporary accommodation, such as a bed and breakfast hotel. But, if eligible migrants have children or are pregnant, in common with British residents, they can only be placed in a bed and breakfast in an emergency, and there is nothing else available. Even then, the LA can only use this option for a maximum of six weeks, when they must be given more permanent accommodation. It is unlawful for an LA to turn applicants away or require them to apply to another council because they do not have a local connection with their area. And, if applicants do not have a local connection anywhere - as will often be the case with migrants - the LA cannot refer them to another council for housing. Of what we have seen, therefore, Mr Cameron is offering us nothing at all. What he seems to be doing is dressing up existing provisions and controls, re-presenting them in such a way as to appear to be "cracking down". In other words, it is smoke and mirrors time once again. The Mail is preening itself at the "brilliant discovery" from its star correspondent, Richard Littlejohn, who today tells us of Dr David Viner and his quote in The Independent from March 2000. That was the one about snowfall becoming a "thing of the past", and a "rare and exciting event". This is all good stuff, but it might have carried a little more conviction if the Great Littlejohn had kept an eye on the blogs. He might then have discovered it appearing on this blog on 27 December 2009. Littlejohn might also have noted that the quote was picked up by Watts up with that two days later, and has since becoming a standard part of the armoury in the war against the warmists. It first appeared in the Booker column in February 2010. But then, we mustn't grumble. For the Mail actually to catch up with what is going on outside its own tiny little bubble is also a rare and exciting event. We should all applaud the speed with which it has come to the party … only three years late. That has to be better than never. Do we expect a new revelation on Hammond by, say, July 2016? By the way, we've got another fall of global warming this morning. And while there is a humorous side to the warmists' stupidity, the damage they do is incalculable. Talk to Scottish farmers about the need to tackle global warming – and see how long you live. As you might imagine, I have been following the Cyprus situation closely, reading hundreds of English language reports, and well as many foreign language reports, and especially those in the German press. The one thing that I come away with, though, is that there are huge gaps in the accounts. We are thus very far from knowing the truth of what has been going on, and the full text of whatever deal has actually been made. The publicly accessible information is to the rest what the tip is to an iceberg. Of very great interest though is the account of the Sunday night negotiations offered by Frankfurter Allgemeine Zeitung, which has it that Herman van Rompuy was the lead negotiator on the night. In fact – or so we are told – the entire negotiation session was at the instigation of van Rompuy, who decided to intervene after consultations with Merkel and Hollande. And how interesting it is to see the Franco-German motor in action again. Apparently, the eurogroup meeting earlier in the week had been so brutal that, after ten hours of battering, finance minister Michalis Sarris had been so exhausted that he could not continue. Thus it was left for the Council president to work directly with Cypriot president Anastasiadis and cut a deal. The fascination of this development is that the negotiations have largely been seen through the filter of national players, with the Germans cast in a prominent role. It is often forgotten that the EU also fields its own players, and has its own agenda, subtly different from the member states. In the event, it was van Rompuy who carried the day, with agreement being reached by two am Monday morning, actually very early for a crisis in Brussels. None of that, though, helps us understand what is really going on. On the face of it, the deal reached should have the Russians up in arms – those who hadn't already moved their money – and the people of Cyprus rioting in the streets. Furthermore, because of the risk of contagion, we should be seeing some action in Spain and Italy to guard against bank runs. Perhaps it is too early to expect a response, with people either in shock or looking to find the missing detail that would make sense of the deal. No that the banks are to stay closed until Thursday, it may take until then before the reaction sets in. 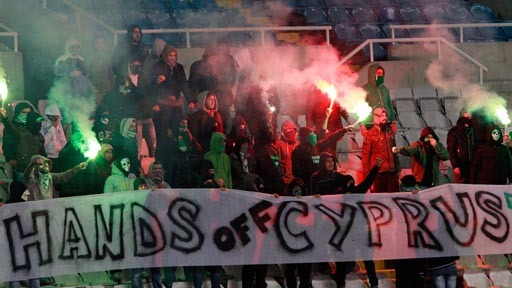 And at that point, we may well find out how well trained and organised the Cypriot riot police are. But one should also remember that this is an island which is extremely adept at guerrilla warfare. No one in their right mind messes with the natives – as the EU may yet learn. Horsemeat fraud: is someone taking the pig? The Danes have been congratulating themselves over the horsemeat fraud affair, after finding that adulteration has not been at all widespread. They have, however, been somewhat disconcerted by reports that 11 of 70 beef samples tested have shown positive for pork. In seven out of the eleven samples, the level was in excess of seven percent. 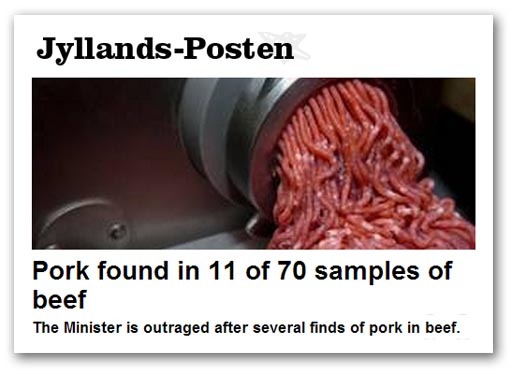 Food minister Mette Gjerskov is "outraged", saying that when there is more than one percent pork in beef, it is not carelessness with mincers and using the same knives that industry often claims. It is cheating and cheating, because there is a financial gain from using pork in the more expensive beef. The minister is now exploring options for tighter controls, looking at whether testing can be carried out, and whether it is best to sample it before it ends up on the cold counter. Whatever else, the minister concedes that there is a need to strengthen surveillance. One wonders though whether there is more to this than meets the eye (so to speak). There is a small price differential between pigmeat and beef, but not anything like as great as between horsemeat and beef. Adulterating beef with small amounts of pork is hardly going to make anyone going to make anyone rich, and seems hardly worth the risk. Denmark, however, is the land of those cartoons, and where there is considerable antipathy towards the flood of Muslim immigrants. Could it be therefore, that the adulteration is driven not by the prospect of financial gain, but for other reasons. Muslims are prohibited from eating pork, which they regard as "unclean" (including those people who don't use toilet paper) , and spiking their food with pork could be regarded as making a statement. And not a few people believe that this is precisely what is happening. 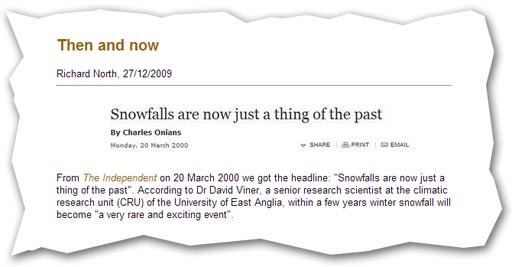 Well, we all remember Dr David Viner telling us that "Snowfalls are now just a thing of the past". Within a few years, he told us in March 2000, winter snowfall, would become "a very rare and exciting event". The thing about warmists, though, is they never give up. 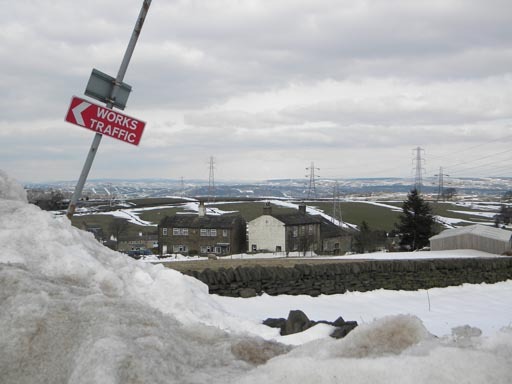 Back in January 2010, after one of the coldest winters in 30 years, we got John Hammond, a meteorologist at the UK Met Office, telling us: "Winters like this are likely to become less of a feature as we head through the 21st century". "Colder winters". He said, "become less likely because overall the background warming will reduce the severity of them, certainly for our part of the world". And now, in the grip of the coldest March for fifty years, with global warming thick on the ground, the fool Beddington, the government's outgoing chief scientist, is telling us that the effects of climate change on the weather were already being felt in the UK. "In a sense we have moved from the idea of global warming to the idea of climate change … temperatures are increasing but the thing that is going to happen is that we are going to see much more variability in our weather', he says, then adding, "I think you only have to look at the last few years to see how that is actually starting to manifest itself even in the UK". Looking out the window at the snow drifts, we can indeed see how this "climate change" is manifesting itself. But we expect no relief from the idiots the government insists on appointing as it chief scientific advisors. Beddington's successor is Sir Mark Walport, former director of the Wellcome Trust, and a medically trained immunologist. This great sage is already imbued with warmism, telling us in 2009 that, "Reducing greenhouse gas emissions is not only essential to help tackle climate change, it is also an important way to improve public health". This is also the man who, in July 2011 was adding to his voice to the complaints that the BBC was giving "too much weight to fringe views on issues such as climate change". You will get nothing sensible from Walport. He is pure establishment. But then that is the joy of being a warmist – you can keep repeating the same old, same old, never having to admit you are wrong. And the idiots in government will always give you a nice cushy job. 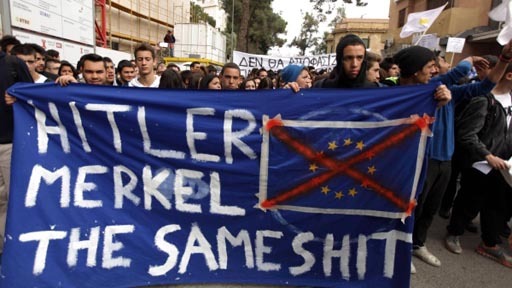 Eurocrash: Cyprus – now or never? UK politics: Tories should behave like Tories? European Council: does anyone care? UK politics: the dishonesty of the "Left"